Why not add visual and textural dimension with our Textured Impressions Embossing Folders? Just as was done on this card, it will instantly give your projects a fabulous look and feel! As for the sentiment, you can't go wrong with the Sweetly Said set of 6. 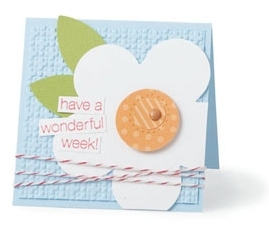 Pair these sweet sentiments with an uplifting design and brighten someone’s day! Available in both wood- and clear-mount.